When an electron beam interacts with a material, a spectrum of light can be emitted called cathodoluminescence (CL). The wavelengths that are dominant depends on the local material composition, configuration, and geometry. In panchromatic imaging, the total intensity of all the wavelengths in a range combined is measured. However, much information is lost, as the wavelength distribution (spectrum) often contains valuable information on the local optical and structural properties of the material. Wavelength information can be obtained by using color filters, but the scan has to be conducted for each wavelength which is tedious. In hyperspectral imaging, a complete spectrum is collected in a parallel manner providing a high-resolution spectrum for every electron beam position. The CL emission is directed towards a spectrograph containing an optical component with a periodic structure that splits and diffracts light into several beams traveling in different directions. This diffraction grating coupled with a pixelated charge coupled device (CCD), a complementary metal oxide semiconductor (CMOS), or photodiode array spatially disperses the different emission wavelengths over the camera so that each line of pixels corresponds to a unique wavelength. 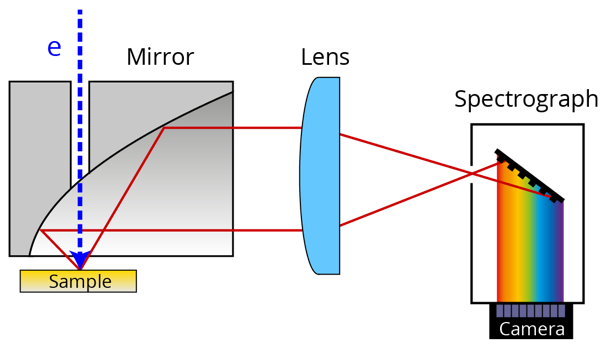 The coupling into the spectrograph can either be through free space, as shown above, or through an optical fiber. Efficient hyperspectral imaging requires a perfect parallel beam from the mirror to the detector, which can only be obtained when the mirror is properly aligned. An ideal example of this is the SPARC system, which uses an advanced micro-positioning system and melt-spun mirror. Without these improvements, light collection efficiency drops by up to 100 times. This means that data acquisition can take 100 times longer or simply becomes impossible because of noise. Detector efficiency is already high enough that further detector improvements cannot physically compensate for these collection losses. The main parameters for hyperspectral imaging are the wavelength range and resolution. The key components that determine these are the lens system, diffraction grating and detector (camera in the diagram), when combined called a spectrometer. Optical lenses must take chromatic aberration into consideration for systems that can span a large part of the UV to IR spectrum. Chromatic aberration (also known as color fringing or dispersion) is the effect where light at different wavelengths are focused at different distances for the same lens. To focus both UV and IR light from the same source to the same detector the lens configuration must be changed. With the SPARC, these optics are easily exchanged, the grating and detector work together. The grating needs to be positioned such that it diffracts the spectrum to the detector. The grating determines what wavelengths are diffracted and how wide the pattern is. This determines the spectral resolution. For instance, if you project a 500nm wide spectrum onto 100 linear pixels of a detector, you would have a 5nm spectral resolution, if you changed gratings or geometry and projected only a 50nm wide spectrum onto 100 linear pixels you would have a .5nm spectral resolution. Typical resolutions are 1 to .1nm. The final piece of the puzzle is the detector itself. Detectors have a wide range of response curves that determine their quantum efficiency, or light conversion capability, at different wavelengths. There are generally no cost-effective detectors with sufficient efficiency for the entire UV to IR range, so often multiple detectors are used, with each specializing in a particular part of the spectrum. Once all of these items are in place entire spectrums can be collected at once from areas of interest on the sample, this is called hyperspectral imaging. Hyperspectral imaging yields a 3D datacube in which two of the dimensions represent the spatial electron beam position (x,y) and the third represents the wavelength. This datacube is similar to what is collected in EDS or WDS but for UV/VIS/IR wavelengths rather than x-ray wavelengths. The CL datacube contains a wealth of information which can be visualized in many different ways. This figure shows two such spectra collected on a quartz sample at different excitation positions. Both show characteristic quartz CL peaks but the blue peak is clearly absent in spectrum 1. Rather than showing the spectrum for a specific point it is also possible to rigorously visualize spatial differences in the emission for every excitation position. 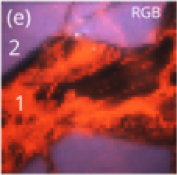 For example, a (false) color RGB image can be extracted from the datacube where the emission spectrum is divided into three RGB channels in a certain spectral range. In this case, we chose the spectral region from 380 to 700 nm which covers both peaks as shown above. Corresponding spatial false color map.